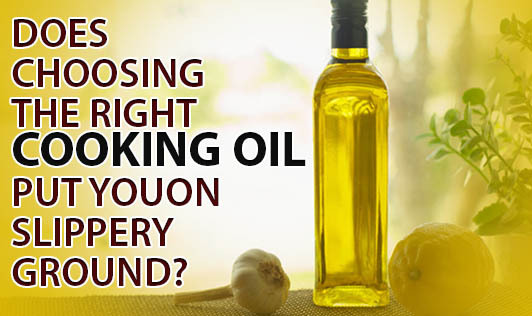 Does choosing the right cooking oil put you on slippery ground? The most frequent question a diet consultant is asked is, "What is the best oil to use for good health?" Every oil manufacturer highlights all the plus points of his product and leaves out the minuses. Moreover, research comes up with a new discovery about oils and fats so often that it becomes confusing for the buyer to choose an oil type at the grocer's. Fat in food was considered to be only a source of energy some years ago. But many studies are now showing the importance of the quality and quantity of fat in our daily foods in relation to health and disease. So, let's look at some of the basics of fats and oils. Fats is the common term for lipids in food. Fats can be visible or invisible. Visible fats are those that we can see- butter, ghee, oil, vanaspati, and margarine. Invisible fats are those that we cannot see and are present naturally in foods- cereals, pulses, meats, milk, nuts and to a small extent in vegetables and fruits. Chemically, lipids are made of fatty acids which can be saturated (SFA), monounsaturated (MUFA), or polyunsaturated (PUFA). Generally the fatty acids of foods of animal origin ie, meat and milk, are more saturated than those of plant origin. Two essential polyunsaturated fatty acids, namely, linoleic acid (LA) and linolenic acid (LNA) are necessary for the body. These cannot be manufactured in the body. Fortunately, we get a large portion of the two essential fatty acids from the invisible fats present in foods. SFA increase the blood levels of total and LDL cholesterol. These undesirable effects favor clogging of the arteries. LA and LNA have the opposite effect. However, LA also decreases HDL or the good cholesterol in the blood. One of the MUFA called oleic acid also lowers blood cholesterol but does not decrease HDL cholesterol. SFA make the platelets in the blood more sticky (promote platelet aggregation) and activate the coagulation system. Both these processes flavour clot formation. Though LA and LNA can help prevent clotting, LNA has a better effect than LA. It is believed that a balance between the two essential fatty acids influences the vascular and immune systems in our bodies. The LA: LNA ratio of 5 to 10 is considered safe. A ratio above 50 is thought to be harmful to the body and might increase the risk of tumour formation. Some oils are hydrogenated to make vanaspati which is more solid than the oils. LA level is low in hydrogenated fats. This process also produces some unnatural fatty acids called trans fatty acids which have cholesterol raising effects. From the values given in the table, how many oils or fats can you find that meets all the requirements to qualify as healthy oil? Remember that oil or fat, should be low in SFA, not contain trans fatty acids, have moderate amount of MUFA and the ratio of LA:LNA should definitely be below 50. So much for healthy eating! In the middle and upper income groups, the oil and fat consumption is much higher than what is required for the body. By ignoring the quality and the quantity of fat intake, we are opening doors to cardiovascular diseases, type 2 diabetes, cancers and so on. On an average, a normal, healthy person may take 40g of total fat- both visible and invisible. If 50% of the total requirement comes from invisible fat, then only 20g of visible fat is needed in our daily food. This would amount to 4 teaspoons per day per normal person. Do you exceed this amount daily? It might not seem so until you start counting! If you count the amount of oil, butter and ghee that is used for seasoning, with toast, dosa, idli and so on, it would probably add to four teaspoons per person per day or more. Then, don't forget the hidden fats- oil present in poori, bhaji, samosas, vadas, pulao, biryani, fried fish, fried chicken; butter or margarine added to bakery foods like bread, cakes, biscuits, rolls and so on; ghee or vanaspati in sweets and fried foods. If the quantity of visible fats exceeds the limit of 20 g occasionally, it won't cause much harm. But, if it happens frequently or daily, there is cause for concern. • Oils from plant sources like groundnut, sunflower, til, mustard, etc do not contain cholesterol. Cholesterol is found only in animal fats like butter and ghee. • All oils contain the same amount of fat and give the same number of calories for a given weight. • No oil contains protein. Only the sources from which oils are derived contain protein. • There is no nutritional differ¬ence between refined, ultra-refined, super-refined, micro-refined and unrefined oils. At the end of this article, if you are still as confused about oils as you were at the beginning, remember that whichever oil or fat you use, be very stingy with it. Beware of fried foods and hidden fats and start counting the amount of visible fats that you use daily.